Leslie Vernick is available as a speaker for your next event. As a Christian counselor and coach, I know that unhappiness, frustration and bad moods are something that everyone experiences. But I also know that there are some simple, Biblical solutions that you can use to live the kind of life that God designed for you. Why holiness and happiness are not opposites, but part of God’s overall design. A potent antidote that can banish bad moods and negative feelings. The importance of what you put in your mind and how it affects your feelings. The benefit of slowing down and savoring the simple things of life. Develop the discipline to take your desires from dreams to reality. Freedom to be yourself, instead of always feeling inferior to others. Courage to take good risks so that you can live up to your potential. Wisdom to learn from your mistakes instead of allowing them to cripple you. A sample of Leslie speaking on this topic is coming soon. Speak up and say “no” without guilt so you stop feeling used. Manage stress so that you stop feeling overwhelmed. Stop pretending things are fine when they are not, and make your relationships more authentic. Take responsibility for faults and failures instead of denying, avoiding, or blaming. Show love toward your spouse, even when you feel selfish or unloving. Respond, instead of react, when a spouse upsets you in order to minimize destructive conflict. Feel less defensive when someone criticizes or corrects you. Cooperate with one another without resentment. Admit mistakes and failures without fear. Let go of past hurts and forgive generously. Leslie speaking at the Association of Biblical Counselors Conference in Dallas, Texas. If you’d like to discuss booking Leslie for your next event contact assistant@leslievernick.com or call 720-432-6472. "9 Common Tactics of Manipulators and What You Need to Counter Them"
You will also receive a copy of my newsletter. Published twice a month with timely help to strengthen your relationship with God and with others. "Leslie has a gift of applying the hard truths of Scripture in a way that makes them seem inviting. If you are half as blessed by Leslie's teaching as me, you will surely grow in Christlikeness." "We were blessed by the truths that Leslie presented so clearly. We received numerous comments on how helpful, practical, powerful and timely Leslie's messages were. She was able to share deep truths of God's Word regarding how to live a life that pleases God in the midst of difficult life circumstances in a way that people could understand and relate to. I couldn't have been more satisfied with how things went. I am blessed for having met her." "There are a many great ladies speakers, but what you provided was not just fluffy, fun, entertaining stuff, but biblical content which gets right to the heart. Your love for God, his Word is so evident in your presentation. Your ministry is unique and your message needs to be heard. Thanks for pointing people to Jesus and the hope that is found in Him and in Him alone." "We highly recommend Leslie as a speaker. During her stay with us, Leslie developed a wonderful rapport with the women, whatever their age or stage in life. She has excellent verbal skills and seasons her talk with solid scriptural truths, personal transparency, and bits of humor. Following our program, Leslie remained accessible to the women as long as needed, answering questions and signing books. Leslie received an overwhelming positive affirmation when we asked for a written evaluation of our evening. We recommend Leslie without reservation." "The beautiful blending of the practical and the spiritual application was just what I knew our women needed to hear. You delivered exactly what you said you would and it was so helpful to our women. They not only walked away with a new love to honor and serve God with their lives, but also with some new practical tools of application to be the "best version of themselves." They loved you! They couldn't wait for each session to begin and were sorry to see the weekend come to a close." 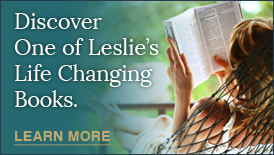 "Leslie lovingly tackles topics many would prefer to avoid such as depression, surviving difficult and/or dangerous relationships, body-image issues, dealing with marital conflicts, and humility. I recommend Leslie highly as a truth-bringing agent of freedom for any women's ministry desiring to encourage and inspire growth and healing in their constituents." "Thank you for your seminar on The Emotionally Destructive Relationship. It was truly transformational as it met each of the attendees with a specific challenge to grow and heal. It was a real WIN!" "Leslie is a gifted communicator. She teaches how to weave God's truth into the daily details of our lives. 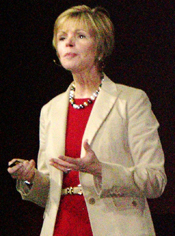 If you want a speaker who will deliver practical how-to's with heart, you want Leslie Vernick." hear fabulous things from the women who heard Leslie speak. Lives were forever changed and God used her in a unique and special way."